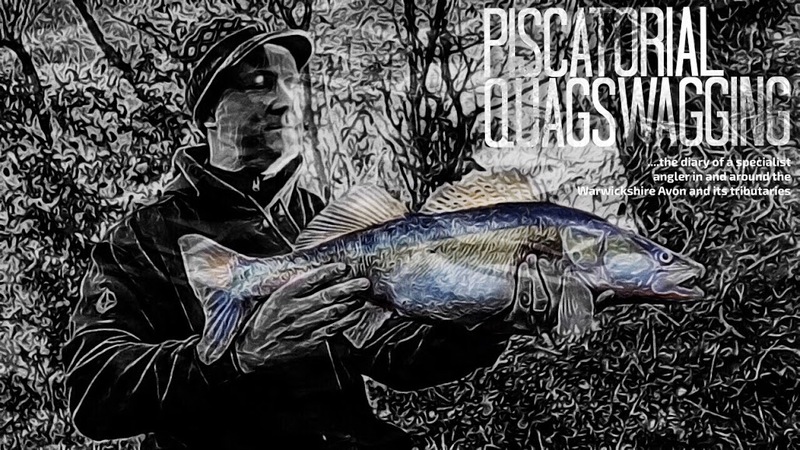 Piscatorial Quagswagging and obviously bored blogger Mick Newey presents the relationship between total length (TL) and wet weight (W) for rod caught Warwickshire Zander. The Zander a non-native species in the UK are now very much naturalised and established within Warwickshire waterways. In 1878 20 odd Zander averaging 0.9kg in weight were netted from Bothkamper Lake in Schleswig-Holstein, Germany and transferred to the enclosed waters at Woburn Park Bedfordshire. Apparently a number of successful stockings from Woburn to enclosed waters in Southeast England took place between the end of the Second World War and 1962. A release of 97 fingerlings in 1963 to the Great Ouse Relief Channel is where the situation changed dramatically, and the species subsequently bred very successfully in the wild and spread through the adjoining rivers of East Anglia. 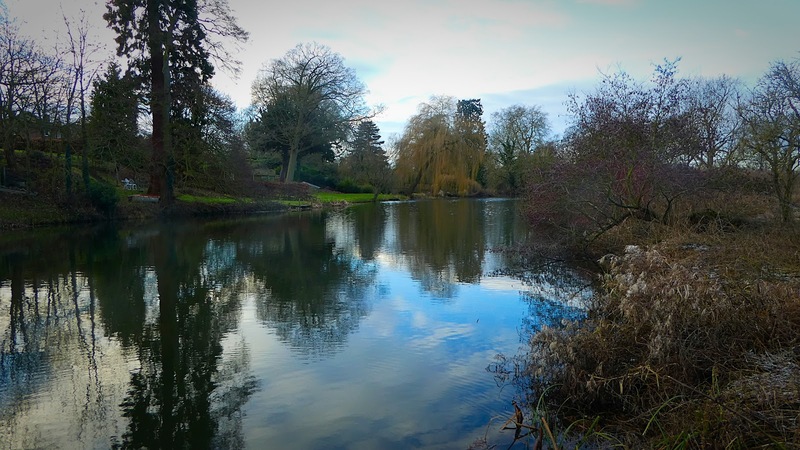 Currently the colonization of the extensively interconnected rivers of this region of England is still only partial but the species is steadily extending its range and has been illegally introduced to other parts of the U.K. by anglers. Zander can now be found in most of the Midlands Canals the Warwickshire Avon, River Severn, the Nene, the Trent as well as the East Anglian fens and ditches and also various lakes in England, now even in the Thames apparently which has given rise to fears of further extensions of the species range over a considerable area in the future. 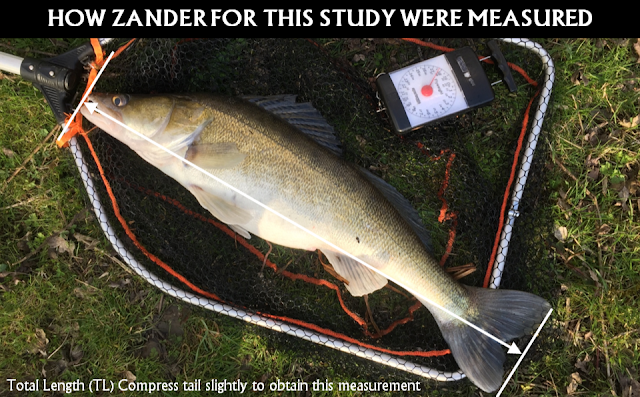 This data is generated from Zander caught from the Warwickshire Avon, the Stratford-Upon-Avon and Grand Union Canals and many a fish is featured in this blog of mine if you want to peruse the archives, there is plenty to look at. Length-weight relationships are important because they allow the conversion of growth-in-length equations to growth-in-weight, for use in stock assessment, allow the estimation of biomass from recorded length and also allow an estimate of the condition of the fish and also the between-region comparison and life histories of this particular species. Could I find something similar online, not a sausage, I found lots of good reading material mind you and enjoyed the research…. 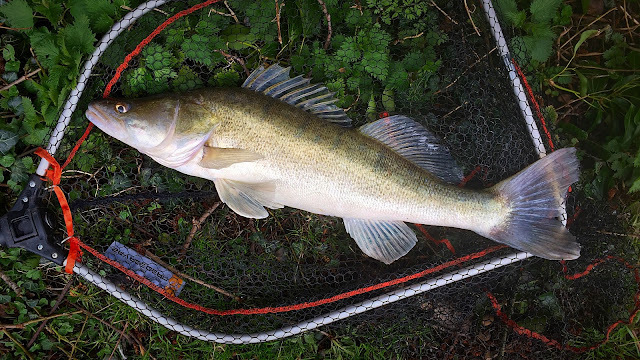 Zander tend to spawn in spring (March-April) when water temperatures reach 8 to 12 degrees. 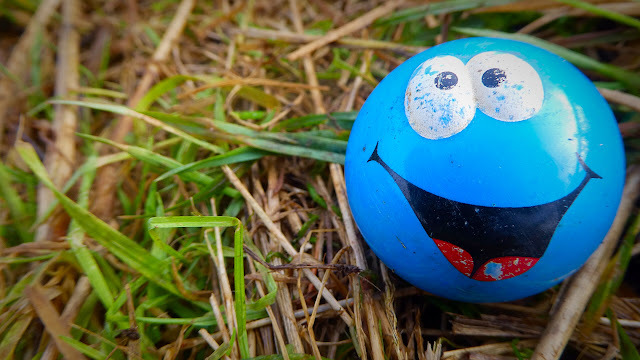 Eggs are generally deposited on the roots of aquatic plants, gathered together in the form of a nest by the male, in sites where the depth of water is between 40 and 50cm’s. Sexual maturity generally occurs at 2-3 years in males and 3-4 years in females when the fish have reached a length of 50cm and a weight of around 1kg. Fecundity is very high and after hydration the eggs are 1.5mm in diameter. The male appears to guard the nest during incubation which lasts between 13 to 14 days. Due to the excellent eyesight of the Zander which love to hunt in low-light conditions, at night, murky water and certainly in rivers and lake large depths, puts them ahead as the waters predator to be feared. The Zander’s eyes shine with a silvery glow even by the most delicate light source. Its reflective guanine layer covering the inside of the eyeball is unbelievably sensitive and allows it to see perfectly in conditions and water clarity when other fish, let alone humans, cannot see anything at all. Having fished for them on countless occasions they are intriguing fish to catch as they are very unlike the indigenous species that share the Midland waterways. In this study the records over many Zander captures have allowed fish to be measured for total length (TL) in the field and weighed (W ,wet weight) to the nearest oz for ease of excel chart generation. For the wooden-headed 1 lb = 16oz. Fish may weigh less than expected for their length for many reasons. Lack of food/prey being a likely cause but maybe because of the overpopulation of the Zander as a predator and competition from other similar fish. A fish may also well weigh less than expected due to change in activity levels or metabolism due to environmental factors. 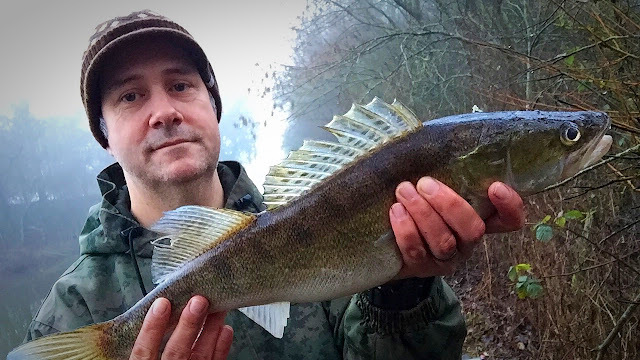 Over many field trips/fishing for Zander which is consequence of keeping and maintaining this fishing blog of mine I really have enjoyed catching them and I will continue to do so. I’d grown to love one particular area of habitat on the Stratford-Upon-Avon canal which not only brought me some much needed solitude but it was home to young but seemingly very well fed fish due to their characteristic larger girth compared to the neighbouring stretches I fished. Having being given some location tips previously I happened upon some shared knowledge and these fish were more than likely down to a fruitless electro fishing exercise by the waterways authority at the time to remove Zander and by way of compensation for the fish removal, it was heavily stocked with a large number of silver fish. 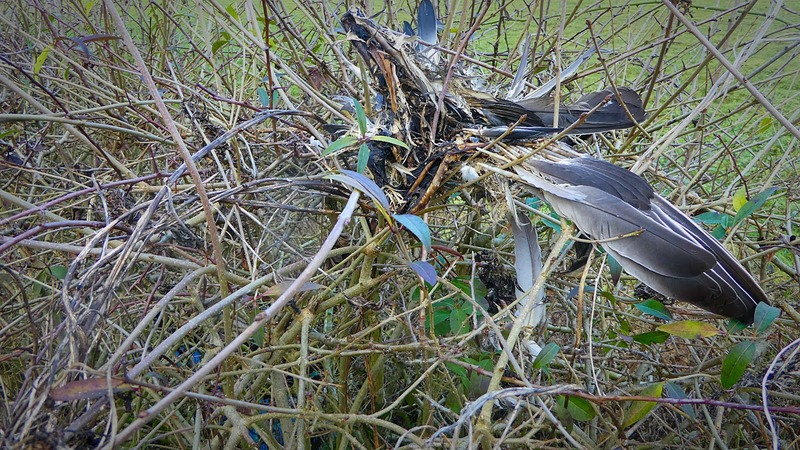 Someone who witnessed the day of the electrofishing was amazed at the amateurish way the task was carried out and subsequently large areas of the canal remained untouched. Those lucky Zander that avoided the cull thrived on these new introductions and are still there to be caught today (transient mind you), and despite the apex predator being present (I haven’t seen an Otter on the canal yet), large numbers of prey fish appear to still exist and as on most stretches I fish there has been a balance reached on the often neglected stretches of the canal. 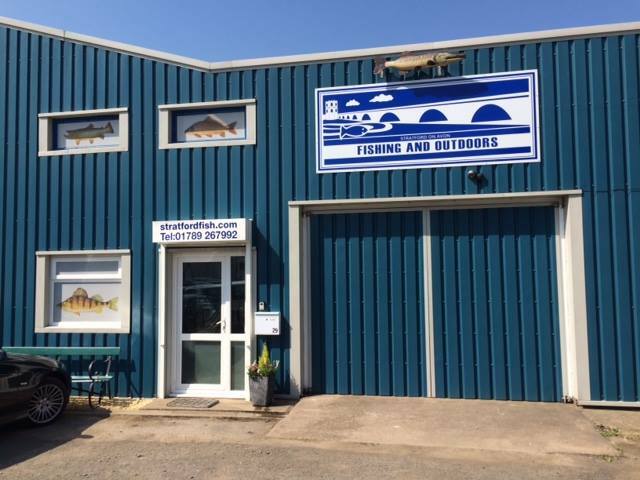 Boats aplenty, anglers not so…. 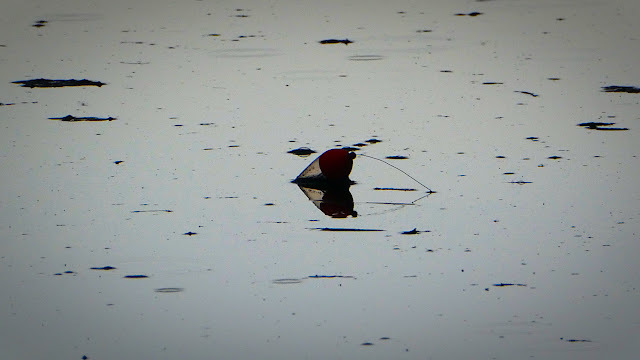 Anglers are a rare sight on the waters I fish you see, why? many factors I suppose, commercial fisheries have sprung up everywhere over the last number of years, Carp fishing has taken over for the tackle tarts and those with bottomless pockets and also many don’t know how to approach a canal, let alone to try and catch an ickle Roach, you can ditch that 6lb line and size 12 hook, try a 1lb bottom and a size 20 hook, you might do a little better. The fish are there to be caught despite the often misguided notion that the Zander have eaten everything. Anyway back to the job in hand, length and weight feature in this graph. Girth is factor for sure, but I’m not Einstein so it isn’t featured but it surprised me just how accurate the chart was for predicting weight on a given length of Zander that populate and seemingly love the Warwickshire waterways. I added some references too, one being detail from the 1979 book Zander from Rickards and Fickling and also generic Walleye data for comparison which seems to fit very well indeed. The curve,well I've used canal data and a polynomial line. There isn't a secret to catching these fish, certainly for the canals travel light, alternate your tactics and methods and rove around as much as you can. It also helps fishing with fellow Zed Heads as apart from the social side of it, it's far easier to cover as much water as possible and also how different approaches can single out fish from stretches that may prove difficult. Predators thrive on neglect so one last tip is so fish waters where others don't. Having caught hundreds now there doesn't appear to be a feeding pattern either, certainly the larger canal fish unlike the river fish are transient and the lower the clarity the catch rate improves but one thing to mention is even the most sunny of days I've caught, even on the river, so get that bait in the water. So the graph, here you go…. Kettle on, tablespoon of Maltodextrin, Monosodium Glutamate, Disodium Inosinate, Disodium Guanylate, Carboxymethylcellulose and hidden in there somewhere, chicken extract and chicken powder, thing is when it’s cold after preheating ones flask, Bovril certainly keeps ones neather regions from doing a full retreat and when looking out the window to a frozen car coffee wouldn’t cut the mustard. I fully expected the canal to be frozen over as the pattern the frost has made on the car roof overnight was a stunning bit of artwork, but having parked up at first light a stick chucked over the bridge in to the canal waters didn’t bounce but luckily splashed. So that meant plan A was ok and I didn’t need to resort to running water and plan B…. The thing was as the morning went on I did wonder if I made the right decision as it was a frustrating session, there was cat ice hanging around on the surface in areas that moved around seemingly in a random fashion. That meant having to move the float over and over again until eventually a clear area could be found so it could be left for a decent amount of time. The lure approach didn’t fair that much better either as often the braid hit the thin layer of ice on the retrieve and eventually the sodding guides started to freeze. What a pain in the proverbials…. 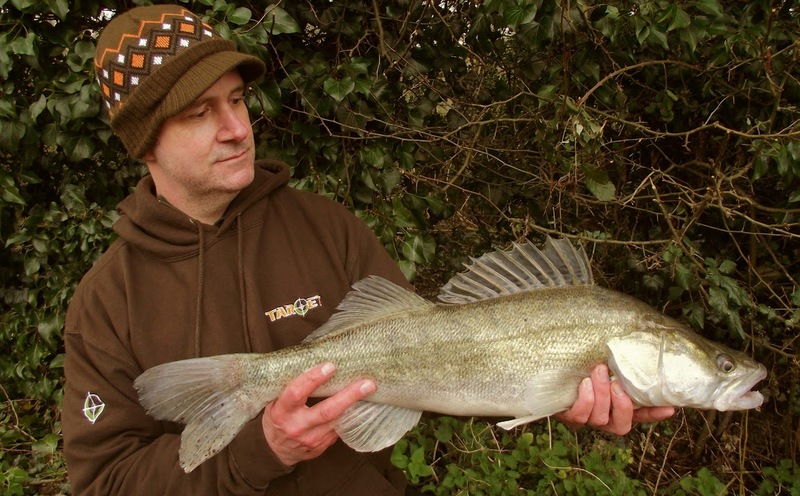 Now I had a Zander first cast on the lure which was a 2lb schoolie scrapper and that made an effort to break up some of the mobile iceberg but the clarity of the water wasn’t conducive for chasing that elusive double figure fish. You could almost see the lure all the way to the bottom, it was that clear. There is also limited boat movement this time of the year also, so not ideal. I don’t usually fish down the edges but bouncing a lure up and down in-between some ice a tiny Zander grabbed the lure, easily the smallest Zander I’d ever seen, probably only 6 inches in length or something like that, it dropped off sadly but another hard nibble of the lure I decided to position the deadbait tight to the margin. It didn’t take long for the float to receive some attention too and sure enough a fish had taken interest. I wait till there is a confident movement of the float and then lean in to the fish, no need to strike. 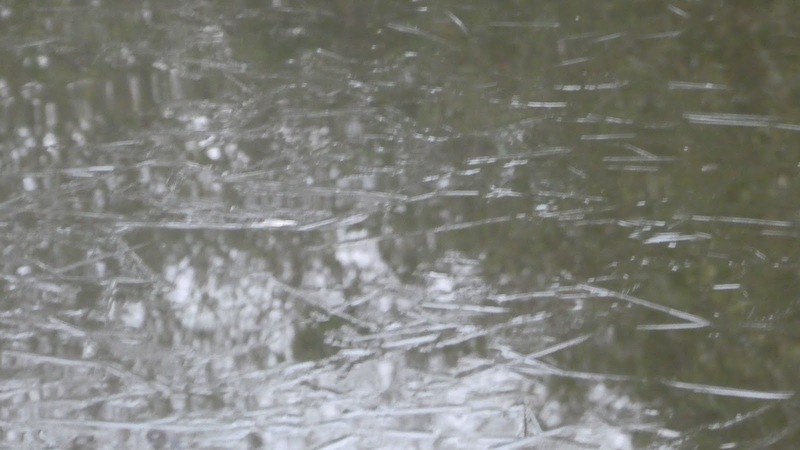 Again, after breaking up the ice that remained another schoolie was banked. Two more small fish on the lure, one missed run on the deadbait, at least I’d managed a few fish. 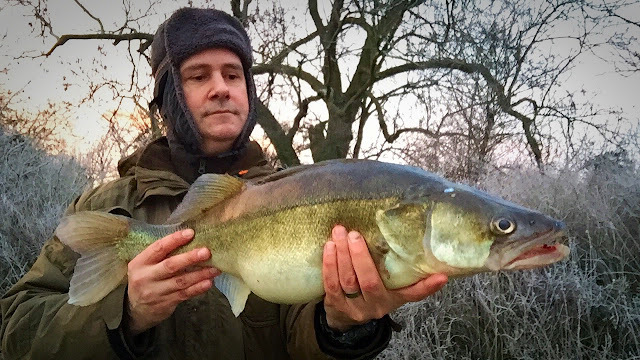 The sun started to rise and it was a little more pleasant but then that seemed to put the fish off, it was stupidly clear after all, having fished many sessions on the canal now, dirtier the better for me, the clarity or lack of it really does make a difference. Out of the blue the owner of the local farmshop we used for years announced he was closing having apparently received a ridiculous bid for their archaic but well served premises, and it was an offer quite frankly he couldn’t refuse. The shoulder of pork we used to buy was utterly fantastic and unlike the water injected rubbish you get at the local supermarkets you could never cook it wrong. Even the Wife, made a good job of it, such was the quality…. The meat was tasty, moist, and succulent and those overcooked outer bits used to melt in your mouth, so much so, come resting and carving time there was a queue in the Newey household. Let’s not talk about the great crackling….please, don’t…. The shin of beef they supplied too which I used for casseroles and curry’s was also worth a mention as the meat was a always a proper colour, you know, dark red not like the bright red stuff they sell in huge quantities for the rank and file that if there were a blind taste taste, you’d be hard pushed to guess the planet it came from, let alone the animal it came from. For the regulars they could bag any of it up and sell it without a problem, a blind bargain if you will. You didn’t have to worry about the change in quality, it was either excellent or superb and cheap too on the most part. Remember It was a common trick in days gone of substituting a cat for a sucking-pig, and trying to palm it off to the unsuspecting. Not so this place….no cats out of bags to be seen there. So the first bit of pork from an apparently reputable local butcher was such a disappointment I’m on a mission to find where they have relocated. My taste buds demand it, as does my wallet…. So why for God sake didn’t I open the bag of deadbait I’d bought at a tackle shop I’d not been in before. I can only assume it had been stuck at the bottom of the freezer waiting for a mug like me to come knocking, sadly being convenient at the time was its ultimate downfall. I’d been sold some manky looking lamprey rather than the Roach I was after. 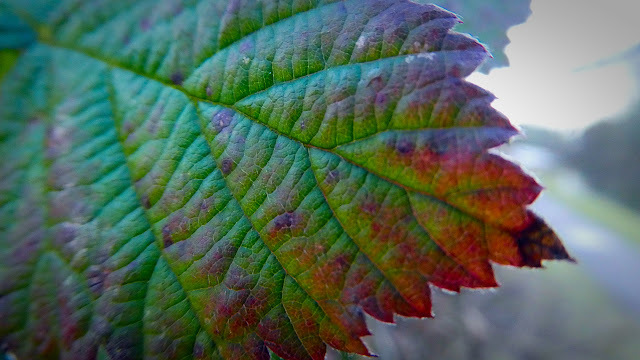 A tinge of green in places and they had almost fused together like a couple of Cadbury’s chocolate fingers clutched by a distracted child sat in a hot car. 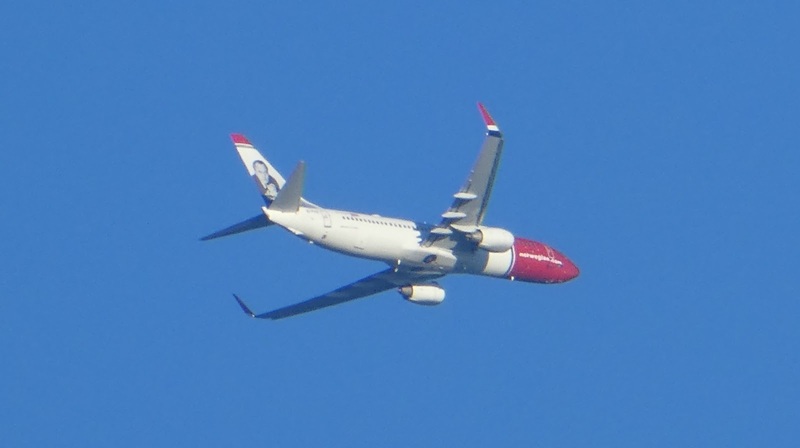 To the layman unrecognisable….a globster if you will. What a great word, I heard that term recently when Sam my youngest was watching some Sea Monsters program on TV and it is used to describe unidentified organic mass that washes up on the shoreline or other body of water. A globster is distinguished from a normal beached carcass by being hard to identify, at least by initial untrained observers, and by creating controversy as to its identity. Maybe I should have become a cryptozooligist as it seems quite a bit more interesting than working on cars. Sadly I was in a rush as I’m happy with a company online I’ve been using for a few years now, the quality of their deadbaits are pretty good, the cost reasonable, packing excellent with freezer bags and polystyrene boxes and the most importantly next day delivery where they are happy to leave it on the doorstep. 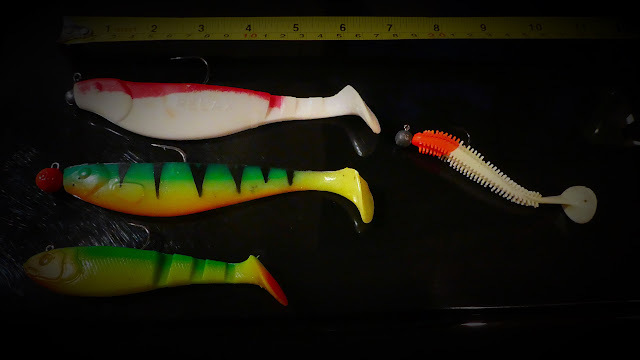 The thing is I didn’t want to break in to the ‘Zander Packs’ just yet as those I’m saving for the cut which are ideal 15-20 2-3” Roach that make bite-sized Zander snackets. I’d used lamprey before when I used to fish Hatton Locks, somewhere I’ve not fished in ages although chock full of Zander, the size not what I’m after, then again who knows with this canal Zander lark especially as this session wasn’t on the canal but on the river again.I was back river to try and track down the lunker of a Zander that escaped from ones clutches that has been bugging me ever since it's happened. The conditions not ideal but hey, put a stomach filler in front of a hungry fish, they are hard pushed to refuse it surely Shirley. 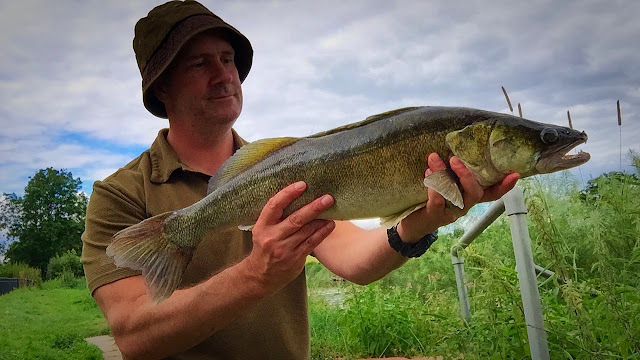 I was a little green-eyed with Dave's capture of a 8lb 13oz, after all if it wasn't for me he wouldn't have caught the fish, but it was great to see and considering it was the first River Zander he had caught, it certainly was a good'un and would have battered my own PB. He gave me a pat on the back as a sign of thanks and that was good enough for me, oh and also the sight of when a big fish surfaces, as an angler, that is also a fantastic sight and it gives our hobby and pastime such an appeal and it's only us as anglers that can appreciate that. 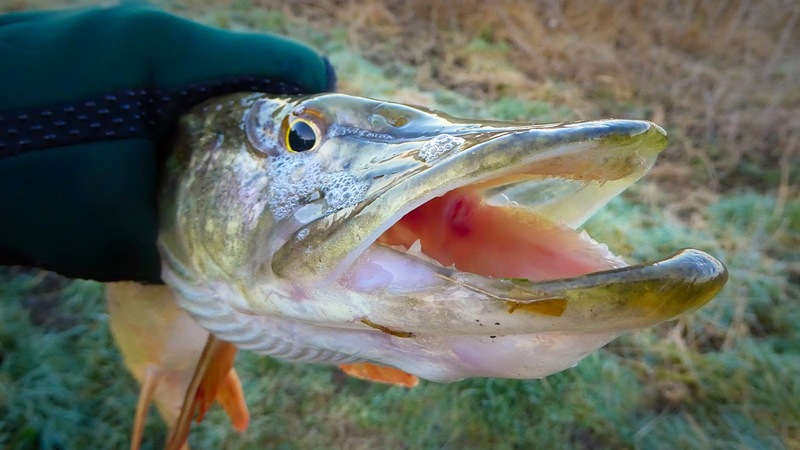 The river was running clear, very clear indeed and I knew it would be a tough morning, if I was going to catch anything it was going to be in the first hour or so and sure enough the first bite came from a Pike within half an hour that took fancy to the manky Lamprey. Maybe it was the fish from a trip out last Friday as it weighed more or less the same, 10lb on the nose. Lovely markings mind you and at least it wasn't a blank. I gave it another hour and with the sun now coming up, I decided to call it a day. 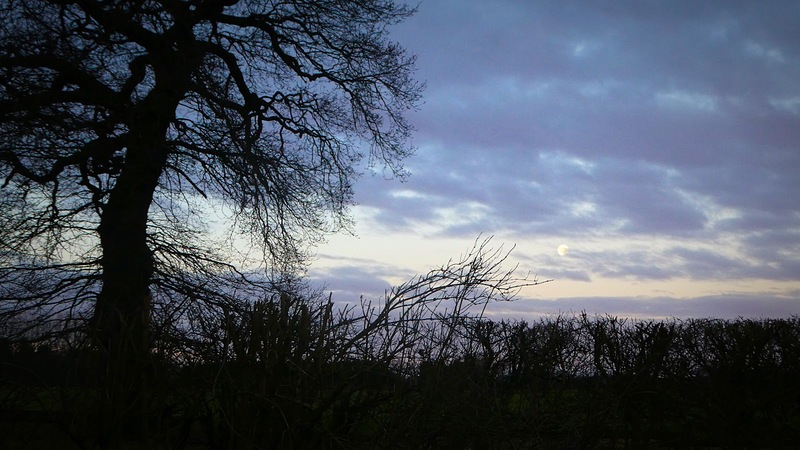 One look out of the window would have sent most people back to bed but more often than not I’ve caught fish at dawn and then after an hour or so things would go quiet. As an angler though, you don’t have an option, you need to get out there. Time and tide wait for no man…. With a much harder frost compared to Fridays muddy and pleasant sunny day this was a different proposition all together. 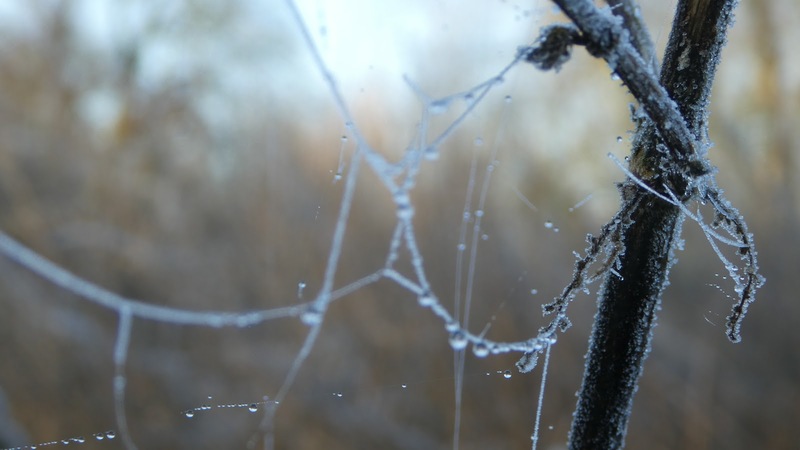 Hard and crunchy underfoot and a biting frost that froze ones exposed pinkies. The light neoprene gloves I’ve been wearing are fantastic, as you can tie a hook without issue but the thumb and forefinger are exposed to the elements. 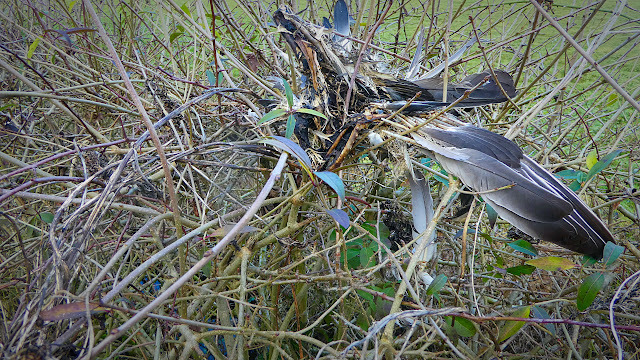 Let’s just say, it wasn’t particularly pleasant…. 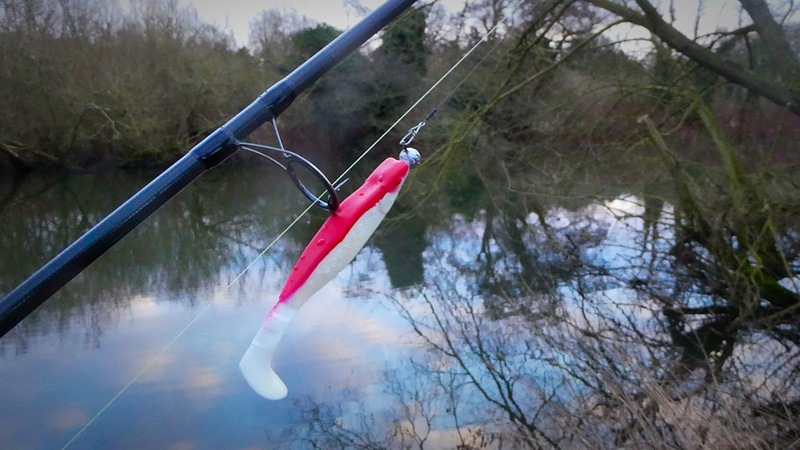 Two deadbait rods with running rig set-ups, a headless Roach, Sakuma Mantas and light bobbins. Now the river had dropped considerably in two days and the cold weather had removed the colour out if it too so I thought it was going to be a difficult session but as the sun rose it started to illuminate the water with its strong amber and red colours I had the first bite. 12 minutes since the rods went out in more or less which is the length of ‘Fools Gold’ by the Stone Roses and lead vocalist Ian Brown. Sometimes when listening to it, it feels a life time, others it’s ended too soon. It was part of my youth after all, the sound of the wah-wah pedal and the volcanic landscape of Lanzarote not forgotten. As a family we visited the Timanfaya National Park, we didn’t stray on the protected environment like the Stones mind you but the track was always in the back of my mind, awesome stuff. Now this bite felt quick, certainly not a lifetime I expected in these conditons,the backdrop chalk and cheese, the coffee still hot. The bobbin jumped in to life, line was being taken from the bait runner and the rod tip was bouncing. Now I’ve caught plenty of Zander to know that was exactly was on the end of the line. It’s a distinctive fight particularly the bigger fish. They either fight well or they don’t, some just decide to give up early, this one didn’t though and gave a good few powerful plodding runs. The lead could be felt bouncing on the line though which is never a good thing but this time the hook seemed to be stuck firm. Then the fish surfaced, yeap it’s a good’un…..
It’s an elevated swim here so not exactly an easy landing exercise and when the fish eventually was netted I gave a big sigh of relief. Not the lunker I was after but still a good fish and great to see in the relatively clear water. Now I’m sure somewhere a weight / length chart exists for Zander but I might even start to compile my own as I’m sure they don’t follow a pattern especially when they get big because although this wasn’t the longest of fish I’ve caught it was certainly the most portly. The stomach was huge and a quick squeeze it must have had an early Sunday dinner. 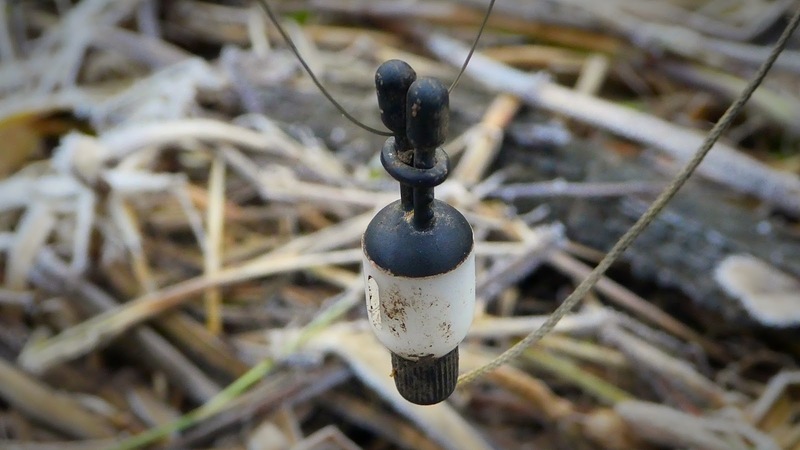 Weigh sling removed from bag, scales attached and then zeroed, the fish went 8lb 3oz…. So a PB river Zander, I wouldn’t say I was disappointed as there are bigger fish here, but at least the fish size are increasing. A jack soon after, the swim went quiet. All before 8.30am too, If I rocked up at 9.00am it would have been a different story I would suspect. ....the ‘turd in the punchbowl’, and that they were most unwanted and they have ruined local rivers and in particular canal fishing. The fact is modern matchman are a generally lazy breed, they love the commercial mud puddles and the F1 filled winter leagues that have cropped up over the years and fishing the cut has fallen out of favour it seems. After all, there are plenty of areas on canals where some decent bags of silvers can be caught if that’s you thing. 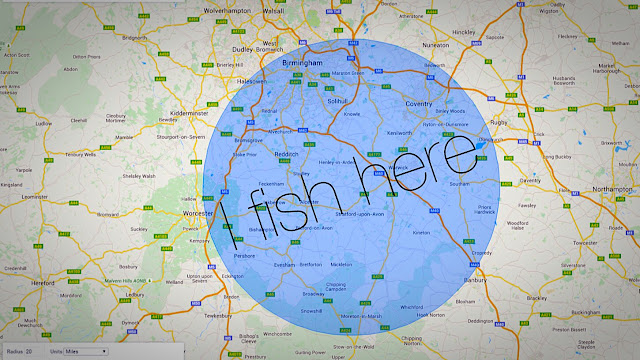 Have a butchers on the Leamington Anglers Association website for starters, bulging nets, smiley faces. He went on his way, with a rant off his chest, me hoping there’s not a resurgence. I like the fact it’s just me and the few, it’s like I have the waterway to myself most of the time. 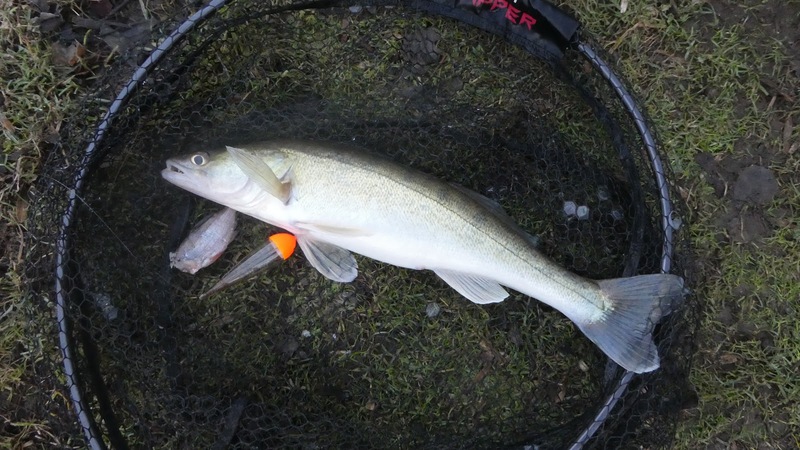 Now Zander really has got me hooked as a species and I didn’t think they would, the pull of a hard fighting Barbel was up there when I got back in to fishing after a long layoff but not so much now. Given the choice, a PB Barbel or a double figure cut Zander, I’d be canal bound as it’s the appeal of catching something so intriguing from something so forgotten. But one thing I’ve neglected is the river Zander, I’m not sure why either as the river holds the bigger fish. So this session as was back at the Warwickshire Avon again with a friend and big fish catcher Dave in tow. Saying that, a big fish would be nice for either of us as we haven’t done very well on these full day fishing trips of ours. A big Perch trip on the lovely lake at Blenheim Palace and a recent specimen Roach search at a carp water, were very disappointing indeed, as the results were as baron as the living conditions of the bark eating residents of Pyongyang. Talking of baron, I’ve said before but this upper stretch can feel very much like that at times. The autumn with its leaf loss and with the winter’s inevitable bankside changes it hasn’t helped its appearance. It can also seem very much devoid of life, it’s as if the fish cannot be bothered to top or to even show themselves, what’s the point, need to go and sulk somewhere else. Even a maggot match, there were some bored blankers. 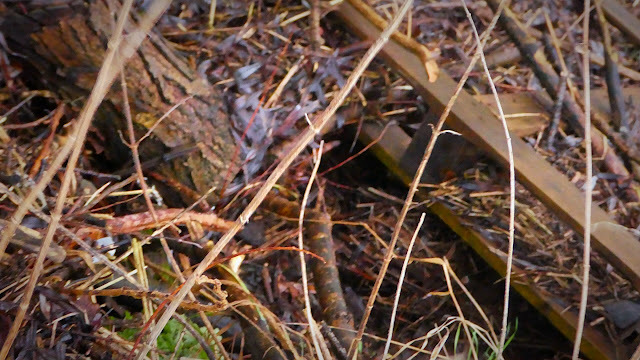 There were some signs of life in a short section of it though…. The small pocket of fish myself and like minded had stumbled upon were giving some encouraging results and some fish of merit were banked and a humongous Pike cropped up for deadbait twitching Sean. However despite many rod hours with a few different methods there were no Zander banked approaching the size the Warwickshire Avon is known to hold. 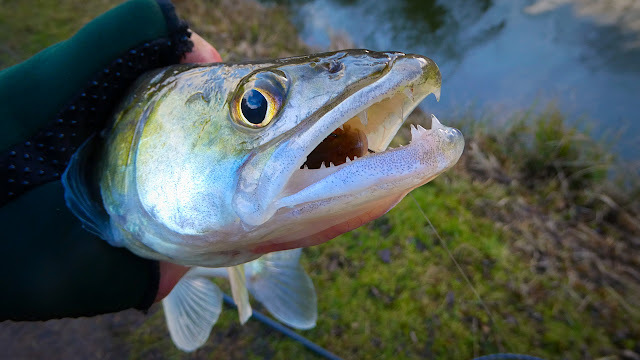 However last weekend’s loss of a big Zander away from the well trodden area confirmed that there are some lunkers to be had that’s for sure, it’s just a matter of putting a bait in the right place and giving them more of a proper go. The little precipitation the waters have received over the last few months has meant the clarity has been very clear indeed. Certainly not conditions that are favourable for catching fish of any species, but in particular the Zander which tend to like water with plenty of colour or sundown to starting mooching about for a belly filler. 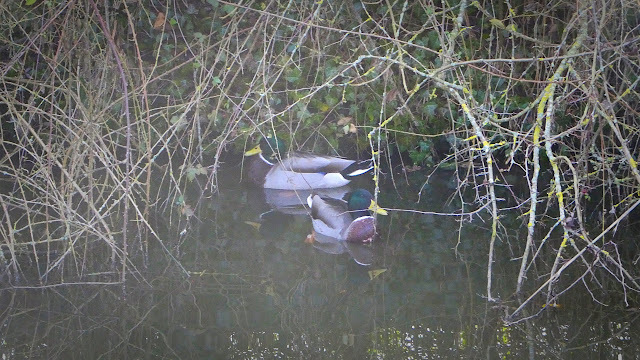 You can see why they are home in the canals as I mentioned earlier, happy as a pig in poo they are. Even in the brightest of conditions they can be caught, but then the cuts water is generally weak tea to caliginous, it really does make a difference. They love the cuts mucky waters, and they are thriving on it…. 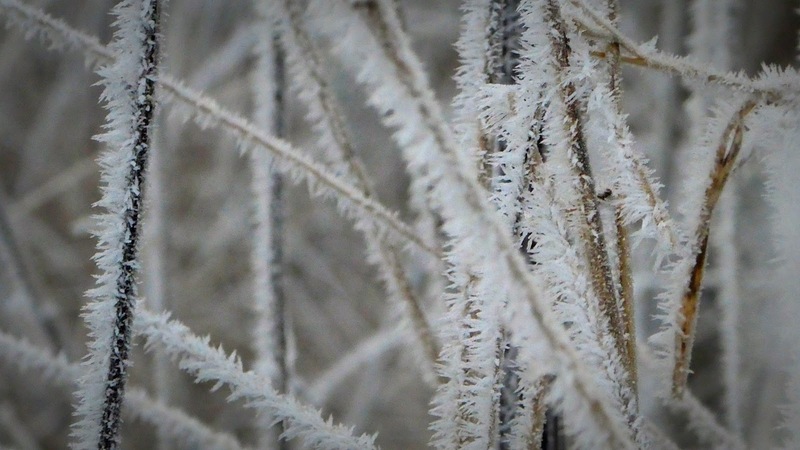 The prolonged low levels had been topped up a little though before this session as some recent wintery weather. With the start of the week being very wet indeed it meant at least there would be some colour in the water which I was hoping would me all the difference. The sky was clear the air cold and upon arriving at the river the was up considerably and it was coloured as suspected. The first swim visited a greedy jack took my roach deadbait and was swiftly returned. I'd two running set-up, Dave two float set-ups so it was nice to see a contrast in styles. The swim went dead so we moved downstream to where I've caught Zander in the past. Within half an hour or so with the odd crayfish beep on my deadbaits during a natter, Dave jumped out of his chair to say that his float was on the move. Sure enough the float sailed under and he leant in to the fish, the plod plod of the rod tip the fish eventually surfaced and it was a decent Zander. Dave not having caught a Zander from running water but from Coombe and the local cut, this was going to be a PB. It gave a good fight with Dave having the thoughts of my loss firmly in his mind. It looked a lump too and having netted it for him, we both thought it looked around 7lb. Now once out the net this Zander and on the unhooking mat this Zander had been feeding heavily and sure enough it went 8lb 13oz on the Avon's. I was well pleased for Dave despite the fact it would have been a river PB for me too. That fish got me thinking as the fish that I lost was a scale above again, so encouraging signs for this part of the Avon. Dave could sit back happy now but considering we had most of the day left we both settled in a couple more swims downstream and got on with the fishing. A biteless half hour and a lost rig that was caught on a marginal snag I decided to go back up to the first swim we both fished. The river had some pace here but there were areas of slack water just off the main flow. Half an hour later my right hand rod screams in to life and a fish is taking line from the reel and the bait runner doing its thing. It was a hard fighting Pike. Now I'm fairy new to this river predator lack having only really done a handful of Zander sessions and the odd lure session so any decent Pike would likely challenge my mediocre PB. The bank is steep here so a long landing net is needed but it was netted easy enough after a spirited fight and looked like a fish worth weighing. 10lb 1oz, do a double and sure enough a PB by a few oz's, happy with that. Dave could see me from his swim and rang to see if I needed to take a photo for me. If it were a Zander maybe but I've got these self takes down to a tee now, so no need really. 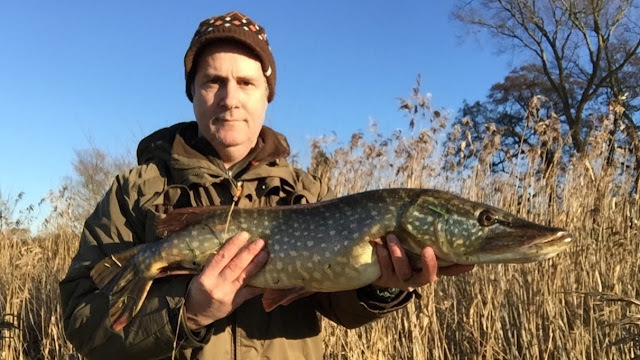 Dave joined me and I managed another smallish Pike out of swim you wouldn't haven't thought they would like but it's given me a few more learning points to be aid me on my subsequent trips. We headed back to the swim where Dave's Zander came from but despite fishing till the floats were hard to see there were no more fish. An enjoyable trip out that not only went quick but 2 PB's were banked. Cannot ask more than that. Now, let me see tomorrow, river or canal, decisions decisions. The handful of times I’d fished this deep and pedestrian stretch of the Warwickshire Avon I’d had mixed results. 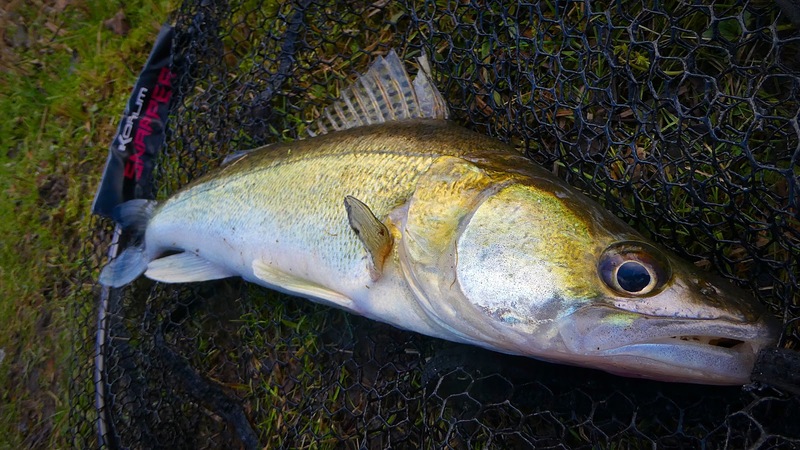 I’d managed some Pike nearing double figures and a couple of Zander whose size was nothing to write home. It’s largely untapped, by me anyway and to be fair probably doesn’t see that much foot traffic. Despite catching some larger Zed’s further downstream just looking at the large expanse of water I’m sure there has to be some specimens lurking. 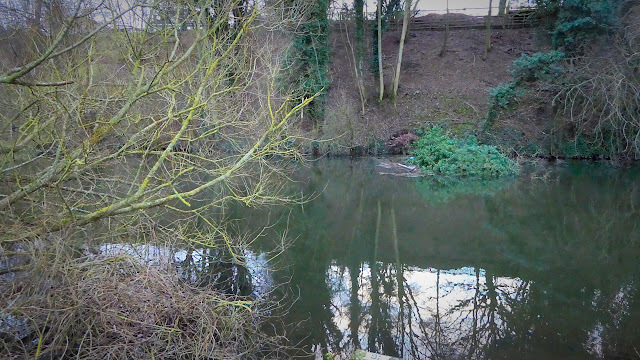 No reason why there wouldn’t to be honest, it looks a perfect habitat for them and I know some decent fish have been caught a little further upstream on a different clubs water. 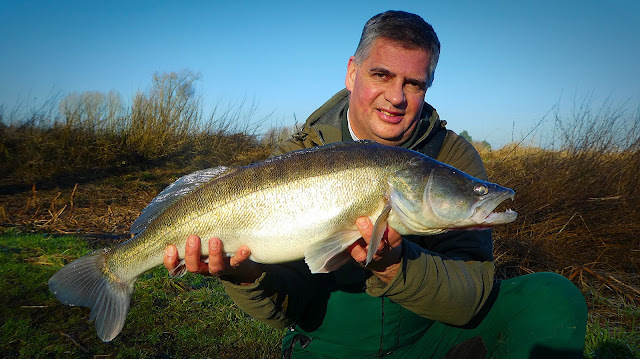 The larger fish have been elusive though up till now, but the conditions have been far from ideal, being mostly clear for weeks on end, which for Zander fishing can put a kibosh on proceedings. My captures for this area, as top trumps go, I’d be on to a right old loser, but you can’t keep a good man down, I've got to stick at it. For this return session it was out with the big guns, the head turners. Considering the size of the river I’d used relatively small lures so I switched to something more befitting the size of fish I'm after and some more visual to stand out in the large expanse of water. The thinking was a little like some past business trips to Shanghai where I could go a whole week without even a second glance, an about-turn, but then out of the blue, a female managed to get through the Han genetics with an error, a DNA enhancement, well two in fact, causing one to get tunnel vision and end up in to an objectifying gaze. They will probably be earning a fortune on Instagram such the oddity, then again can you get Instagram in China ? As everything else the internet is useful for seems to be blocked under their Golden Shield Project operated by the Ministry of Public Security. Even Blogspot is blocked FFS….then again, you get all manner of crap on there don’t you. There is nothing that I can do about it to be fair, it’s a natural reaction, and it’s how I’m wired. I assume it’s an evolutionary trait and it appears I’m not the only one, as this interplay of objectification, internalisation and perpetuation which permeates society. Hmmm I wonder if Zander are inflicted and affected as much by visual eye-candy. You see unless I can tempt a nice Zander I’m looking at pastures new me thinks. I cannot quite put my finger on it but I’m not eager to get fishing at these club waters like I have done in the past with stretches of the Warwickshire Avon. I was so looking forward to get stuck in come the start of the season, now not so. You only have to look at my Blog and the canal visits I’ve made of late…. It’s regularly matched fished you see, even in the winter as I’ve been finding out and there appears to be the need to fish lighter and lighter as the fish are not stupid, they wise up to anything that stands out. Small hooks, small baits is the way to fish it. I’m not a matchman and therefore cannot really comment on the ins and outs, but Barbel kept in keepnets doesn’t really sit right with me either to be fair and subsequently I’ve not had the enthusiasm to give them a proper go despite knowing there are decent specimens to be caught amongst the apparent large numbers of smaller fish. 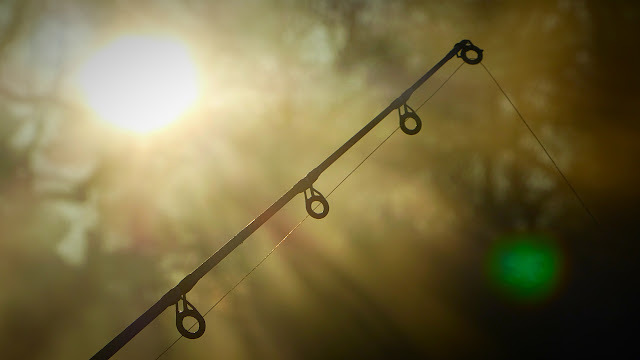 Anyway back to the session apart from the lure rod, I’d also have a sleeper rod with me where I’d fish a running set-up with a deadbait to fish a margin or feature to try and increase my odds of picking up a fish or two. With 5 swims already tried without a bite, it was on to the last swim. It was much shallower here which wasn't a good sign but heck might as well give it a go.The roach deadbait was positioned a couple of rod lengths out in front of a tree and within a few minutes after throwing the lure around the bobbin started to jump and the alarm sound. A fish had taken the bait. After leaning in to it felt a decent too and with the initial run abated, eventually I got the glimpse of a big Zander. With ones heart now in one's mouth it was out with the landing net to prepare to land the fish. Sadly that's what exactly happened because one last gasp run and a shake of the head, the fish was off. I'd recast aanother bait rang the Wife to say I'm having another hour but despite the odd knock and tap it remained elusive. Now we all question what happened but with Zander less so, they are difficult to hook at the best of times. 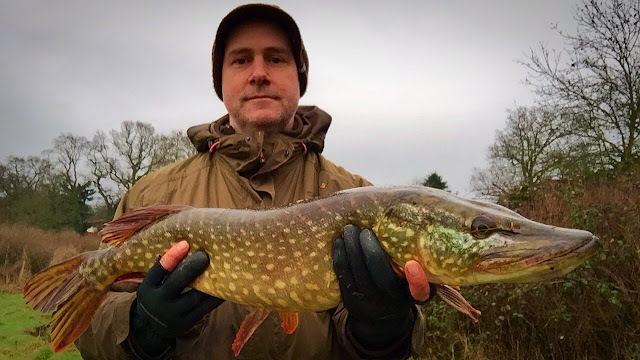 My usual canal set-up is a 11ft 1.5 TC rod, but this was a 9ft 2.5 TC rod because you've always got a chance of a big Pike here, don't want to be undergunned so I'm thinking using the thin wire Sakuma Manta's that work so well on the canal with a soft rod might have not been the ideal hook for a much stiffer rod, maybe it was a hook pull when it gave the last powerful run. Weirdly replaying it in ones head if I'd lost the fish on the canal I'd be more gutted but at least I know there are some good'uns here now and I might well renew my book after all. 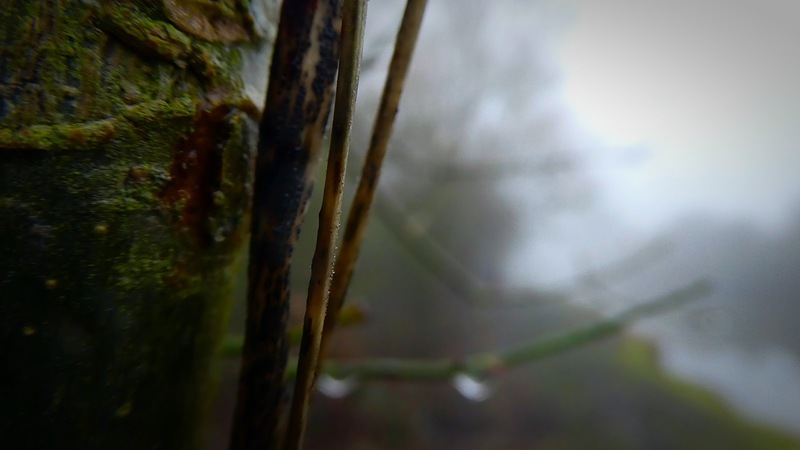 I’d fished a handful of times below the lower reaches of the Laryngeal Prominence without even a nibble, a bite, or even a tiny Perch to show for my efforts so I was in no rush to go back, especially as the weather was going to be rather wild. A photo appeared of a cracking double figure fish which was caught on this particular canal, more or less this time last year, and it’s only when I was looking at a Facebook mail trail screen grab Dave sent to me recently (I’m not on it ) where the picture was posted again, something stood out. 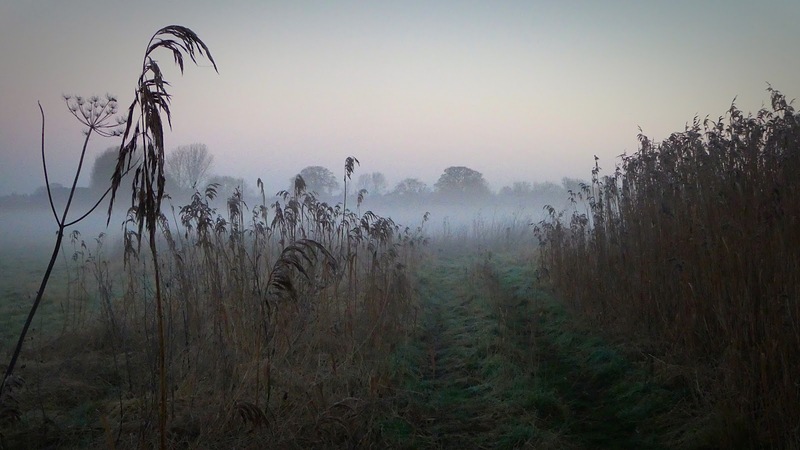 As someone who has trodden the towpath on much of its length you tend to recognise features and landmarks which are stored in ones subconsciousness.I’m sure I’ve been past ‘that’ even though it was pretty well hidden in the background behind some thicket was most prominent in the photo. Sure enough a quick look through the photos on the anglers Facebook page, one of his pictures revealed that he had indeed visited the stretch where I thought it was. Even the most careful of big fish captures who try and disguise an area the best they can, sometimes slip up and a swim can be recognised. We as anglers spend many a hour on the banks don’t we so it’s just the way it is, not a fat lot you can do about it. The thing is does revealing a specific swim or area really matter….? I’ve been finding with this canal Zander lark that you tend to find pockets of schoolie Zander that will always be there but the specimens will be there one day and gone the next. These lunkers appear to be transient after all, nomads and hobo’s if you like. 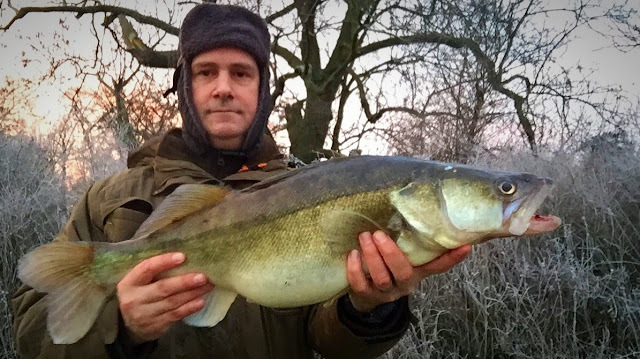 I can tell you that I’ve fished the same swims where I’d caught my PB of 9lb and the second biggest at 8lb 10oz many a times, and up till now, I’ve not had a sniff of anything like those two fish that graced my landing net again. However was this fish different? 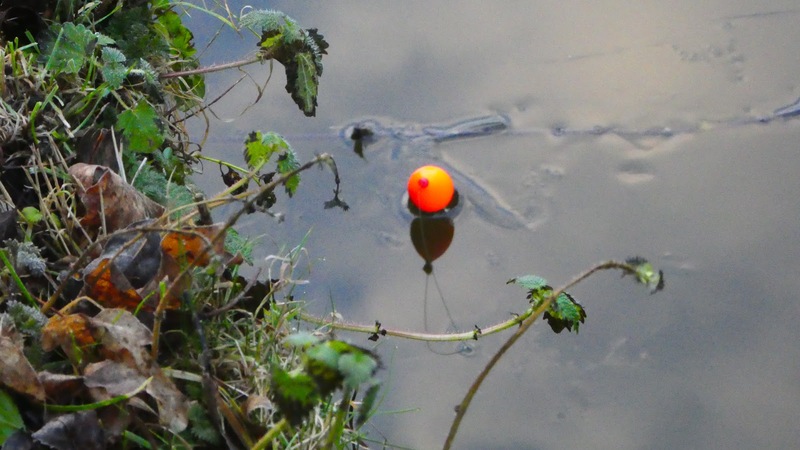 As it appeared that after losing it on a previous session the eventual capture returned to the same swim and managed to bank it. Now I’m not a big fish chaser usually ,I’d leave that to those well conversed in it, but if this fish is still milling around these waters which is unusually full of prey fish I’d like to catch it as it will be a zed with a capital Z. It will be a proper’un, a lump….if you Phil. The large Carp appear to be very different and the more and more time I spend on canals it appears that they tend to settle in one area and stick with it. If I do eventually catch a double figure canal Zander maybe they will become my next target. There are some beasts to be had too judging by the ones I’ve seen when Zed’ing as they don’t seem to mind sharing the same swim from what I’ve discovered. The bruiser and the cruiser, top and tailing…. Now this Zander was apparently caught on the lure which I was surprised at because in my experience a deadbait has been more selective with 5lb being my biggest lure caught fish. For this session in to dusk it was a Roach chunk out on the sleeper and a lure rod as the main attack. 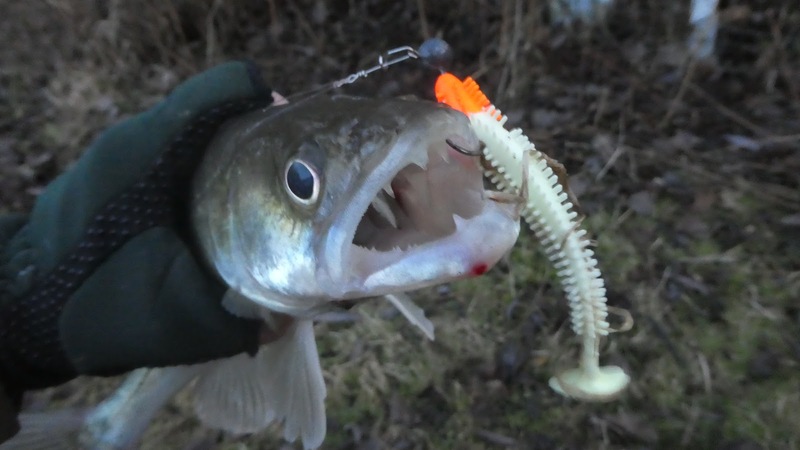 Recently I’ve been enjoying my lure fishing and you can see why it’s become so popular, it can get very addictive with the aggressive Zander and the sense of anticipation. There are more shiny bits to buy which can only be a good thing, got to spend money on something and enjoy the fruits of ones labour haven't I…. Thinking about it, I did manage a schoolie by the bridge, so might was well give it a bash. 1 rod my usual overdepth float set-up, the other the lure rod. Better get going. Now swim bound I can spot the 'feature' but hmmm, looks like it, but not quite, looking at the picture again. 90% there, could be, might be, hey maybe it's been altered since the picture was taken, who knows. So better get on with the fishing. After about 7 or 8 chucks of the lure a small schoolie, grabbed the lure. It isn't hooked well so managed to get free, but at least there is Zander here. Next was the deadbait rod, three fish caught over the length of the cover. The biggest three pound. Another Zander banked on the lure, a reasonable session but for the last half an hour in to dusk I was hoping for something decent. 100ml of milk, 75 grams of flour, a little water, 2 eggs, some dried sage and onion salt, season. Whisk, leave, room temperature, ready to go…. Fan oven set to 210 degrees. 6 cup muffin tin, the much needed groundnut oil that makes the difference, preheated. Fill mixture to rim, watch it bubble, oven bound. Meat up top, spuds and puds below, door closed. 25 minutes, jobs a good’un, watch them rise. Give them a go, I’ve been tinkering with ones Yorkshire puds for some time now and they are a revelation. Aunt Bessies lazy frozen jobbies, GET OUT !!!! You see mediocrity is not something to be relished in my opinion. I’d watched a YouTube video the other day you see with a name embroidered lure fisherman drop shotting a miniscule micro lure in a local canal where he caught over 3 and ¾ metres of tiny perch. 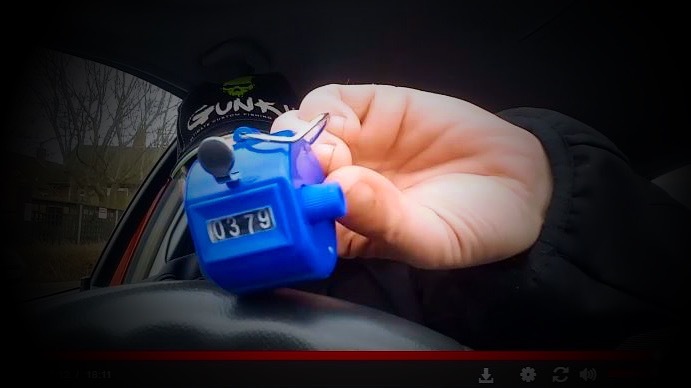 Now the thing that struck me was not only the fact that he actually measured the length of each and every fish caught despite not being in a match but also the fact that he had a corresponding tally counter that he proudly displayed at the end of the video. And ‘wasping’, what’s all that about….? 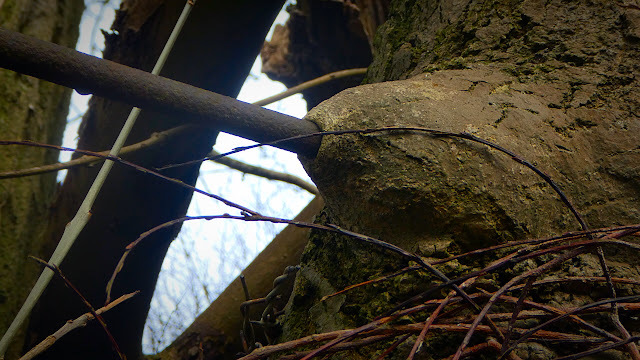 After skipping through the monotony there was certainly nothing to put a bend in the rod from what I could see. However I can now see why many lure clubs are changing their match rules to the 3 biggest caught rather than total length as come on, be realistic some of the Perch looked like they were just out of nappies and therefore naive after their new found freedom. Now, I’ve no doubt bigger fish would eventually succumb to this method but it looked completely alien to me as the resulting fish were rivaling a nats nadger. I've said before though, I ain't a match fisherman, but I can see why the technique is well practiced, micro lures catch plenty of fish. Then I had an idea !!!! which I have from time to time believe it or not that may benefit the type of fishing I partake in. You see my ongoing quest for a cut double I’ve been using 12cm Fox spikey shads on the whole where the results have been reasonably productive for Zander and Perch but still nothing to touch the results on chunks of roach. 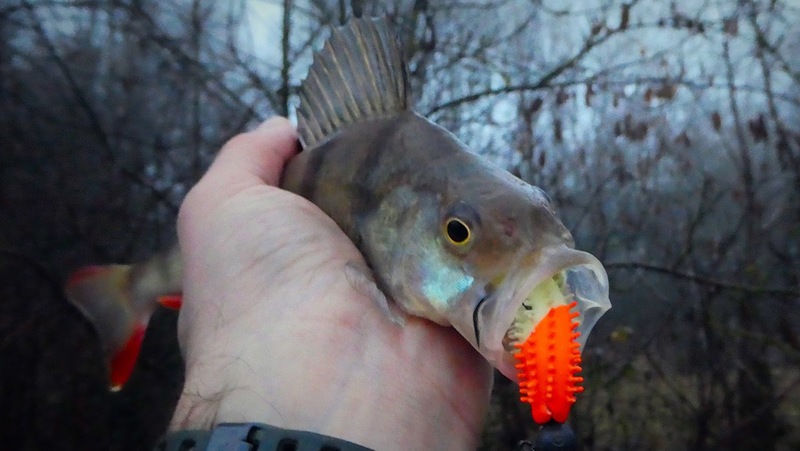 Maybe there was something to learn from these micro lure tip tappers after all. 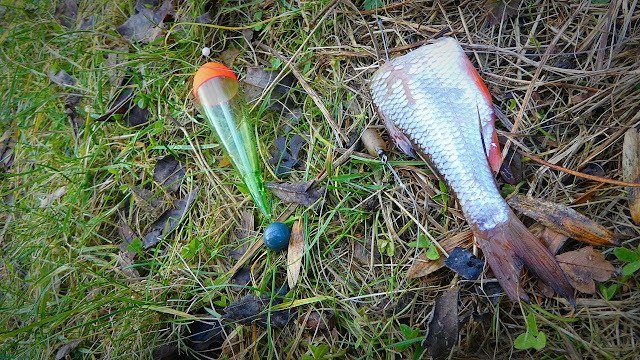 What about using a lure more befitting the size of the fish I’m trying to catch…. Thinking about it, an ‘A’ cup wouldn’t turn my head, a set of ‘DD’s , no question. As it got lighter I could see, oh yeah, BALLS !!!! Weird as it hadn't been freezing over night. Only a thin layer and the areas that looked fishable just didn't appeal. 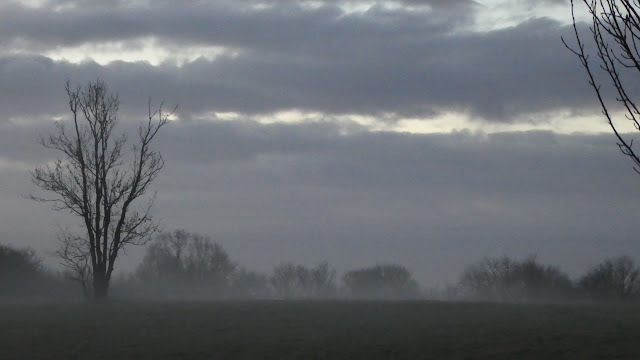 Again, foggy but this time it was fine. The clarity wasn't the best, clearer than I usually like. I decided to start small and go big, to one of my most successful lures was put on. The Red Headed Fox spikey shad. I upped the size to 4.5" and sure after a few plucks as Zander nailed it, not the biggest but just goes to show, they don't mess around. 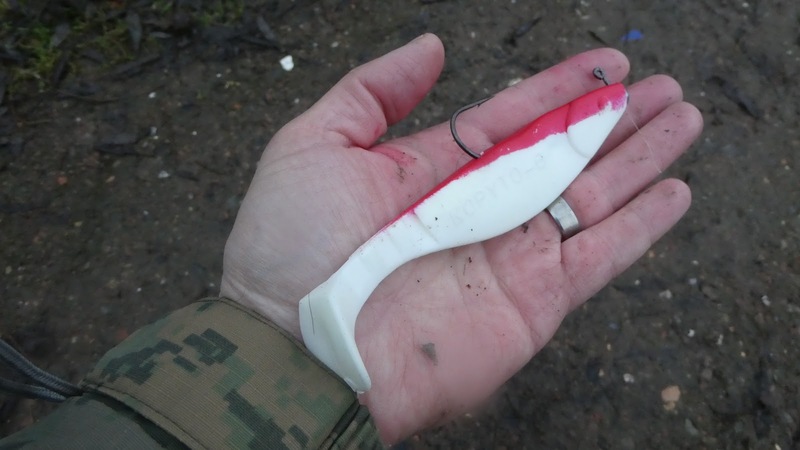 The next lure I'd used down the river before. A firetiger pattern with a slightly slimmer body than the white Kopyto, which is the larger lure I thought I'd try. Now the canal especially away from the boat track is very shallow indeed so these lure are not ideal. 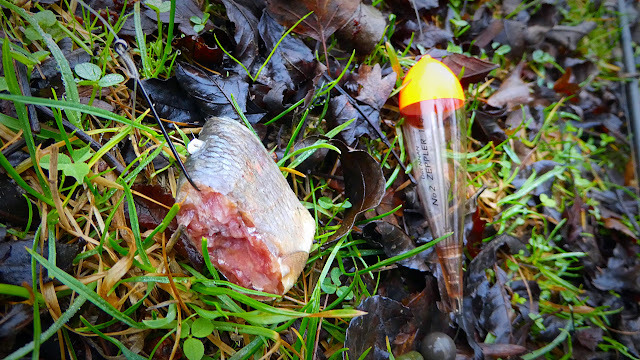 It helps that the hook point is on top of the lure though so less issue with catching debris. So it's a matter of casting out, leaving the lure to bottom out and then slowly retrieve the lure. 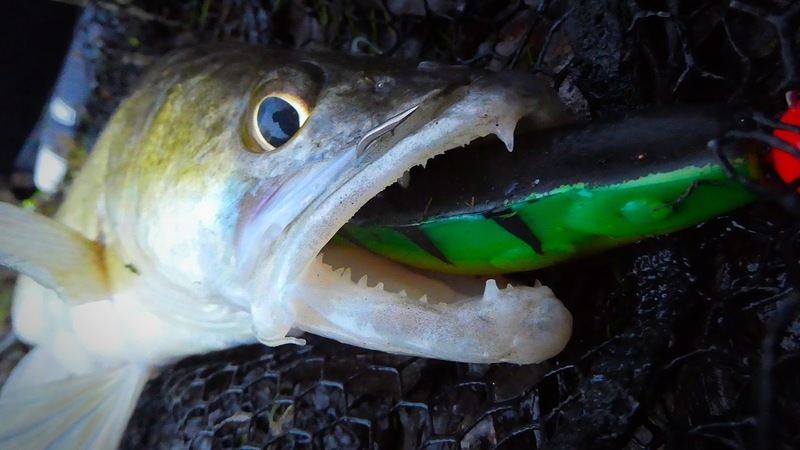 I've found Zander like to sometimes take a lure on the drop but it's difficult with these larger lures. Anyway after half an hour I though about downsizing but after a few nibbles and plucks eventually a fish grabbed it. This felt larger than the last fish but after seeing it's flanks it was still a small fish. It properly nailed it though and just goes to show. Zander look like they have relatively small mouths but a bit like a Perch, they can get their jaws really well open to be able to target their prey. 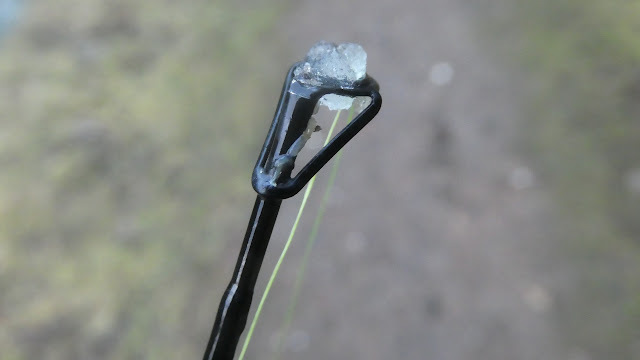 So on the last lure, the Kopyto, to be honest this looked ridiculous and I was in two minds whether or not to try it out but after fitting it with a 5g jig head it performed pretty well to be honest. The biggest issue is the disturbance on the water. It was a little like Peter Kay in the John Smith's advert, it's a tank slapper, a depth charge. Maybe on the river that's ok, but a small canal, I'm sure the fish would keep their distance. Now I tried for an hour and there was certainly fish interested as every now and then something took a nibble of the tail. The clarity didn't help as it was too clear for a proper good Zander session but it was good to experiment me thinks. 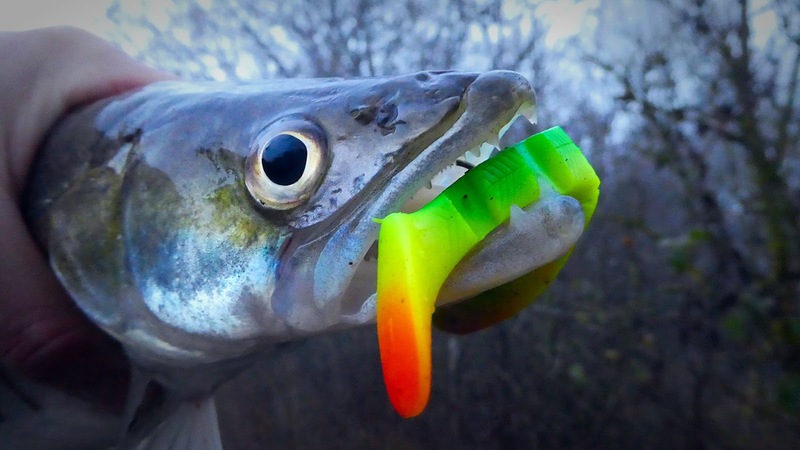 I'm thinking I might try this lure down the river where hopefully I can snare a Pike or a Zander. Switching back to the spikey shad I had another 2 schoolies in quick succession. The larger fish I'm after didn't show, but come on this is Zander fishing, I'm still learning and I've caught bucket loads of them now. A river session me thinks....maybe this time with a dead bait on a sleeper rod.